This post is about how to buy your first ukulele. One of the many great things about playing ukulele is that you don’t have to spend much money to get started. A good beginner’s ukulele will cost you under $60. Makala Dolphin is a very reliable beginner’s ukulele in this price range. But there are other good brands too. I don’t recommend spending less than $50 because cheaper ukuleles are often harder to keep in tune. You might save $10 or $15 – but you might also buy yourself some annoying tuning problems. With any other instrument – flute, guitar, keyboard, violin, etc – you’d have to spend hundreds, just for a beginner’s model. Most people start with a basic ukulele and then invest in something a bit better after their first course, when they know what they’re looking for. You can get a pretty good ukulele starting from $200. If you get in touch with local makers, you can even buy a hand-made instrument. People sometimes ask me about hiring a ukulele to begin with. Buying a ukulele is so cheap that hiring isn’t really worthwhile. If anything goes wrong, you will have some accountability. E.g. if you find that it doesn’t stay in tune, you can take it back and they’ll fix it or exchange it. This is harder to do when you buy online. You are supporting the local music economy. A music shop with knowledgeable staff is a community resource of useful advice. You get to try the ukulele out. You can ask the shop assistant to tune it and play a few chords for you. Shearer’s Music Store, in Anglesea St, across from the bus station. There’s plenty of parking in front of the shop. Keith MacMillan Stringed Instruments, 36 High St, Frankton – next door to Village Organics, across the road from the railway line. 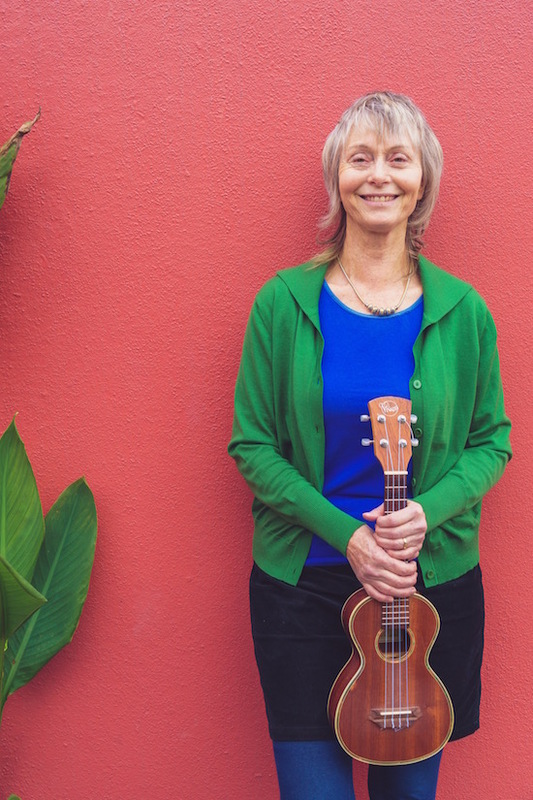 If you’re in Australia, here are a couple of online retailers selling Makala Dolphin ukuleles at good prices: Derringers and The School Locker. NB I’m not getting a commission from these. There are several different sizes of ukulele, ranging from soprano (the smallest), to concert, tenor and baritone. Your first ukulele will probably be a soprano. Most of the cheapest ukulele models are sopranos. 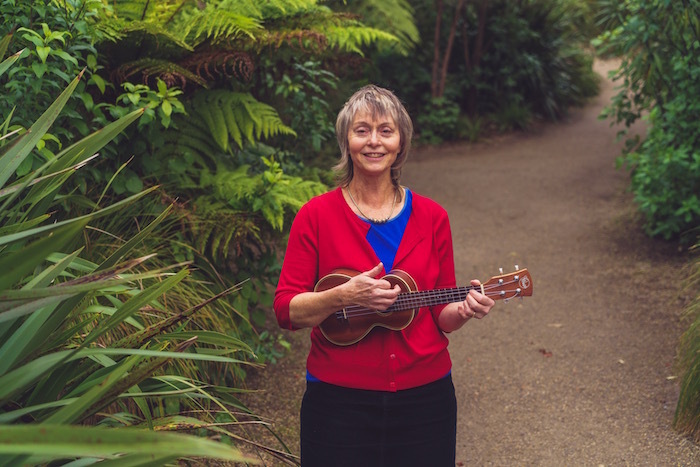 Keith MacMillan commented to me that he thinks adult beginners (especially men) should consider buying a concert sized ukulele to start, rather than one of the tiny sopranos. It’s easier to play if you have large fingers. He sells concert sized Makala Dolphin ukuleles for about $NZ85. That’s one of the most reputable “starter” brands. However, I also know plenty of men who are happily playing soprano ukulele without any problems. Soprano, concert and tenor ukuleles are all usually tuned the same way. Concert and tenor ukuleles make a louder sound and usually have a bigger fingerboard. Some players prefer an instrument that has more space for their fingers. A baritone ukulele has different tuning, so isn’t suitable for a beginner, because the chord shapes will be different. Whether your family heirloom is trash or treasure, you’ll at least need a new set of strings. Good ukulele strings will cost between $15 and $20 for a set. It’s not worth the time and bother of putting on cheaper strings. Good quality strings will get the best tone out of a basic ukulele – and they should last well. 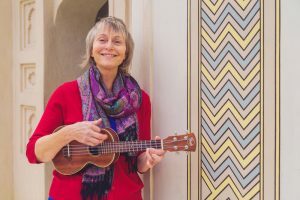 I hope this has answered your questions about where to start when buying a ukulele. Click this link to watch my Youtube video about how to tune your ukulele. And here’s a post with other resources for beginner players.